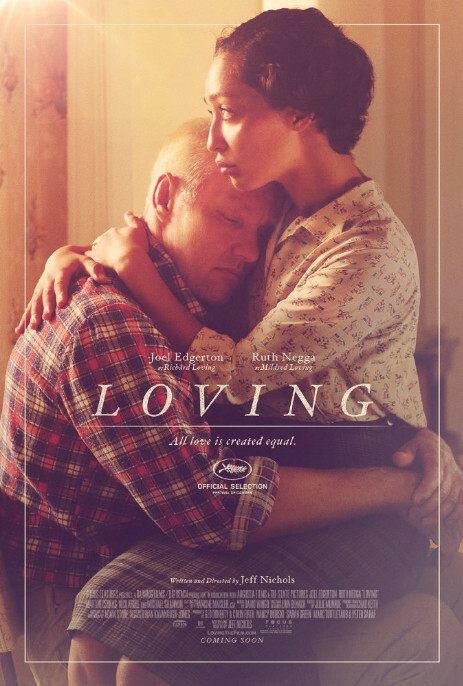 Richard Loving (Joel Edgerton), a white man, is in love with Mildred Jeter (Ruth Negga), a black woman. When Mildred finds out she is pregnant, she marries Richard. In 1950s Virginia, this is illegal. After Richard and Mildred are arrested. Their prison sentence is suspended on the condition that they leave Virginia and do not return together for 25 years. Mildred and Richard sneak back into Virginia so Richard’s mother Lola (Sharon Blackwood), who is a midwife, can deliver their first child. They are once again arrested, but are allowed to leave the state and told not to come back. Returning to their home in Washington, Mildred writes Attorney General Robert Kennedy, who refers her to the ACLU. ACLU attorney Bernard Cohen (Nick Kroll) tells the Lovings they may have an opportunity to have their case heard by the Supreme Court, but there would be risks involved. Loving tells the true story of Richard and Mildred Loving whose Supreme Court case made it so interracial relationships were recognized nationwide. While it is an important story to tell, unfortunately it doesn’t receive the development it deserves. Joel Edgerton, as Richard Loving, spends most of his time staring into the distance in the film. Aside from being present, he isn’t given much to do. In fact, a good portion of the movie is just characters staring at each other. Maybe Richard Loving was a man of few words, so this is a deliberate choice by writer and director Jeff Nichols. Unfortunately, it comes across more as Nichols just didn’t know what to say. Ruth Negga’s Mildred Loving is seen as taking most of the initiative in the relationship. She is the reason they travel back to Virginia. She is the one who gets Robert Kennedy and the ACLU involved. She is the reason anything at all happens in the movie. Negga’s performance far exceeds Edgerton’s, if only for the fact that he does not do much aside from gaze pensively. Nick Kroll is a surprising choice for an ACLU attorney in such a serious story. His performance is better than I had expected, but it was a little hard to shake the image that it is Nick Kroll. As I said, the Lovings’ story is an important one that needs to be told. Most people probably are not aware that this was an issue and the lengths this couple went to in order to get the nation to change. Sadly, some of the impact is lost on the film’s long run time devoted mostly to nothing happening. If Nichols could have packaged the story in a more succinct way, it could have been a much better film. As I have said with other films recently, Loving is an important lesson in how brave people have enacted change within our country. Unfortunately, the execution of this particular story isn’t up to the level as, say Hidden Figures. You should see Loving as a reminder of what used to be, but I would recommend waiting until you can rent it.